Collins, M.m.c.. "Electric-Power Generation". The Canadian Encyclopedia, 04 March 2015, Historica Canada. 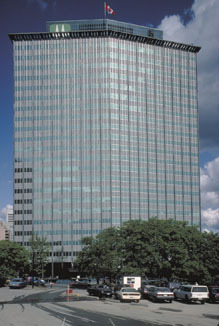 https://www.thecanadianencyclopedia.ca/en/article/electric-power-generation. Accessed 19 April 2019. In Canada the 2 basic methods of producing electric power are hydroelectric generation, based on the energy contained in flowing water, and thermal generation, based on the production of steam. MacLaren pulp and paper plant at Masson, Québec. Solar panels for pre-heating water (photo by Jim Merrithew). In the Saguenay-Lac-St-Jean region of Québec (courtesy Alcan Aluminum). In Canada the 2 basic methods of producing electric power are hydroelectric generation, based on the energy contained in flowing water, and thermal generation, based on the production of steam. Thermal generation may be conventional, using coal and petroleum products, or nuclear, using uranium in thermonuclear fission (see Nuclear energy). Canada is abundantly supplied with most of the resources from which electric power can be generated, and Canadians are among the world's highest per capita producers and consumers of electricity. Canada's installed electrical generating capacity in 1994 was 114 gigawatts (GW = 109 watts): 56% derived from hydroelectricity, 18% from coal, 14% from nuclear power, 7% from oil, 4% from natural gas and 1% from other sources. Installed capacity is the amount of power that could be generated at a given instant if all power plants were working simultaneously at full capacity. Actual production depends on the amount of time particular generators are running and on load (appliances, motors, etc) placed on the system. Electric utilities build 10-25% extra capacity into their systems, above the expected maximum load, to serve as backup during emergencies and maintenance shutdowns. In 1994, total actual production in Canada was 533 508 GWh. Of this, 61% was hydroelectric, 19% nuclear, 15% coal, 3% natural gas, 1% oil and 1% other sources. The difference between the various sources' shares of capacity and production (ie, a higher proportional production from hydro and nuclear, lower from fossil fuels) reflects the economics of electric-power generation, and the pressures placed by conservation concerns on petroleum-based thermal development. 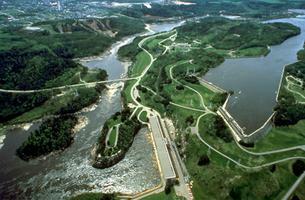 Hydroelectric generation converts the energy of Canada's rivers into electrical energy for industrial, commercial and residential use. Building a dam to retain water requires a large capital investment, but the method has several major advantages, being nonpolluting, being based on a renewable resource and requiring no expensive fuels. 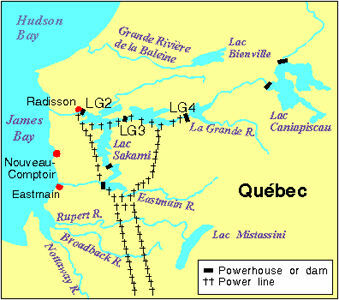 Canada's principal hydroelectric generating stations and their installed capacity are LG-2, on the La Grande River, Qué, 5328 MW; Churchill Falls, on the Churchill River, Lab, 5225 MW; and Gordon M. Shrum, on the Peace River, BC, 2416 MW. LG-4, also on the La Grande River, was installed in 1986 with a capacity of 2650.50 MW. Thermal generation uses the heat energy of fossil fuels or uranium to produce steam to drive a steam turbine which is coupled to a generator. In addition to its fuel requirements, a thermal plant must have a supply of water to cool and condense the exhaust steam from the turbine so that it can be reused in the steam cycle. Conventional thermal plants have relatively low capital costs but high operating costs. Their disadvantages include pollution from exhaust gases (see Acid rain; Air pollution) and low efficiency. Efficiency is limited by the Carnot cycle of a heat engine, which effectively means that less than 40% of the heat energy of the fuel is converted into electricity, the remainder being lost as waste heat. Several research projects are exploring ways to use this waste heat for agriculture, aquaculture or industrial purposes. Canada's principal coal-fired generating stations are Nanticoke, Ont, 4000 MW; Lakeview, Ont, 2400 MW; Lambton, Ont, 2000 MW; and Sundance, Alta, 2200 MW. The partly natural gas-fired and partly coal-fired Richard L. Hearn facility in Ontario has been mothballed. Oil-fired facilities at Lennox, Ont (2295 MW), have also been mothballed. A nuclear power plant is a thermal plant in that steam is produced by a nuclear reaction and used to drive a conventional steam turbine. However, the economics are quite different since the capital cost of the plant is high and the construction time longer than for a conventional thermal plant. The complexity of the plant also adds to the operating cost. Such expenses are offset by the low cost of fuel and the absence of atmospheric pollution, factors that make nuclear generation using the Canadian CANDU system economically attractive in parts of Canada, notably Ontario and the Maritimes. Concern remains about the long-term storage of the spent radioactive fuel. Canada's principal nuclear generating stations are Bruce "A" and "B" (6400 MW) and Pickering "A" and "B" (4300 MW). A 4-unit nuclear-fueled generating station constructed at Darlington, Ont, had an installed capacity of 3600 MW when completed in 1992. Unlike most other forms of energy, electricity cannot be stored economically in large quantities. Instead, the energy is stored in fuel stockpiles or in water held above hydroelectric dams, and power is produced on demand. The demand on a typical power system varies significantly with time of day, season and general economic activity; hence, the number of generators and the load on each must be varied. To meet this varying demand, 2 types of generating plant are required for base-load generation and for peaking generation. The base load is the continuous minimum demand; the peak load is the maximum demand. Thermal plants are more suited to base-load operations because they take a long time to warm up and bring on line, and they operate most efficiently at a constant load. Nuclear plants have an added base-load advantage in that their capital cost is high and their fuel cost low; hence, they are most economical when run at a high, constant load. Hydro plants can be designed as either peaking plants or base-load plants, depending on the ratio of electrical capacity to water flow and water-storage capacity. If a hydro plant is operated in parallel with a thermal plant, the hydro plant is typically used for peak loads, as it can be brought on line quickly. Gas turbines are also well suited to peaking generation since they start up quickly and have low capital cost and high fuel costs. The location of electric-generating plants is always a compromise between the location of the population to be served and the location of the energy resource to be tapped: the longer the transmission line to the service area, the higher the effective cost of the plant. Hydroelectric sites require a stable base for a dam and geographic features that minimize the necessary size of the dam and control structures; the effects of flooding above the dam must also be considered. For thermal plants, the availability of cooling water is a crucial consideration. Proximity to a fuel source or cheap transportation is a major factor in choosing a location for coal-fired plants; electricity is cheaper to transport than coal. The safety concerns of neighbouring populations can influence the siting of nuclear plants. The mix of electric-generating sources varies considerably across Canada. In 1980, hydroelectricity provided most electricity in Newfoundland, Québec, Manitoba, BC and the YT; coal, in NS, Saskatchewan and Alberta; and oil, in NB, PEI and the NWT. Nuclear power provided about 28% of Ontario's electricity production, ranking a close third after hydro and coal. Nuclear generation began in NB in 1983. 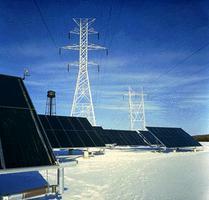 Many alternative means of electric-power generation are under active study. These include tidal energy, wind energy, photovoltaic solar energy, ocean thermal energy, ocean wave energy, geothermal energy, magnetohydrodynamic generators, nuclear fusion energy, low-head and small-scale hydroelectric dams, and thermal plants burning biomass and peat. Cogeneration, the production of both heat and electricity, can substantially improve the economics of thermal stations. Two of the alternatives, vertical-axis windmills and tidal power, are being used in small-scale trials at present, but it will be some years before they offer a significant alternative to the resources now in use. Canada is also participating in nuclear fusion research to a limited extent, because it will be at least several decades before fusion is available to generate electricity commercially.